Z Contractors, Inc. is Hiring Now! Michigan Construction partner Z Contractors Inc. was established in 2010 and is based in Shelby Township. Specializing in bridge and concrete construction, the company has built a highly skilled staff with Quality Construction and Uncompromised Safety. Z Contractors’ professionals include top level, industry-leading supervisors, project managers, foremen, carpenters, operators, and laborers. This developed team works well together due to the respect, dedication, and hard work of the entire company. Regarding employee safety, Z-Contractors Inc. believes that no job or task is more important than worker health and safety. This statement is part of Z Contractors’ corporate mission. If a job represents a potential safety or health threat, every effort is made to plan a safe way to accomplish it. Every procedure can be and will be a safe procedure ensuring a safe environment for all employees. 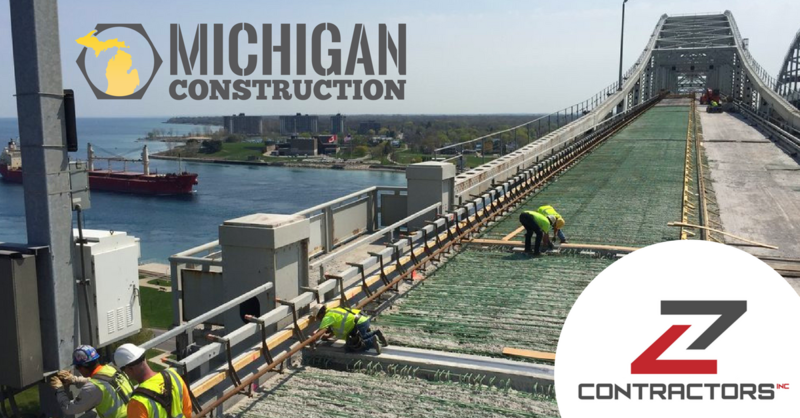 Z Contractors is prequalified with the Michigan Department of Transportation and routinely works with local road commissions and municipalities to replace the bridges and roads that comprise Michigan’s infrastructure. Z Contractors delivers unsurpassed quality from demolition to foundation piling, sheeting, structural concrete, pump station rehabilitation, and construction. The company completes over $40 million in projects and is a member of MITA, a Michigan Construction partner, and more. Blue Water Bridge — Overlay of the Blue Water Bridge, Port Huron to Sarnia, Ontario. M1 Rail Detroit — Construction of Woodward bridges over I-75 and I-94 Detroit. Ambassador Bridge Connector — Completion of the missing link between the Ambassador Bridge and I-75 Interstate in Detroit. Livernois Bridge — Bridge replacement in Oakland County. 13 Mile Bridge — Bridge replacement on 13 Mile in Oakland County. Sebewaing — Bridge replacement in Sebewaing, setting precast box beams. ACM, Ypsilanti — Highway speed loop bridges. Z Contractors is hiring now! Apply today!